Harman/Kardon is a name that is well-known in the audio world. They have been powering home theaters and high end cars sound systems for years. They have a rarely matched quality and precision that comes at a price, but doesn’t make you regret the spending. You can expect a quality product from Harman/Kardon. Good news is they have broken into the portable speaker world and produced an affordable bluetooth speaker called the Harman/Kardon Onyx. 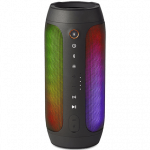 They have just released the third generation of their portable speaker and below, you’ll find a full review. I wanted to find out if the Onyx 3 holds up to the world renowned name of Harman/Kardon as well as find out if it compares with the best bluetooth speakers on the market today. The Harman/Kardan Onyx Studio 3 is the latest portable speaker from the iconic brand. It has some really cool features like allowing 3 different devices to connect to it for multiple DJ’s or using different devices from different areas. Harman/Kardon produces an incredibly clear and loud sound from all of their products and the Onyx Studio 3 is no exception. This thing rocks! It sounds so crisp at any volume with fast and steady bass response. No matter what kind of music you listen to, you’ll be very impressed with the clarity. The one issue I did find with the Onyx Studio 3 is the battery life is only 5 hours. That is considerably lower than the industry standard for a speaker in this price and quality range. It is a durable speaker in the sense that it will handle a light tumble. Other than that it is more of a work of art. It is not water proof and a large enough drop will surely hurt something inside however this isn’t really the speaker you’d take to the beach but rather leave out during a dinner party or a backyard BBQ. The price is much higher than most of the competitors but the sound quality shows you exactly why. The Harman/Kardon Onyx Studio 3 is an excellent at home portable speaker that has incomparable sound quality for a speaker this size. The Harman/Kardon Onyx Studio 3 has a price tag of $449.99 which is considerably higher than most portable speakers on the market. Harman/Kardon has never been known for being cheap but there is a reason for that. With this price you do get unmatched sound so if you are a true audiophile you probably won’t mind the price tag. If you’re looking for the biggest bang for your buck, you might be interested in something with more battery life and waterproof capabilities, which ae easily obtainable at this price tag. One thing is for sure, you probably won’t find a better sounding bluetooth speaker than the Harman/Kardon Onyx Studio 3 at that price. The customer reviews for the Harman/Kardon Onyx Studio 3 are very positive. The only negative reviews I was able to find were a few people had connectivity issues with some older devices. The devices they were having issues were pre-2000 which actually surprised me that they were that old and still working! The only other complaint was a short battery life. Many people just keep it plugged in and take it outside for a party only to return it to its primary station. The Harman/Kardon Onyx Studio 3 has stellar customer reviews when it comes to the sound. The Harman/Kardon Onyx Studio 3 is a high performance bluetooth speaker that really needs to be heard to be appreciated. Standard to Harman/Kardon style, they’ve ignored many of the bells and whistles you get with other brands and stuck to what really matters and that’s the sound. You’d be hard pressed to find a better portable speaker at that price when it comes to sound quality. If you want a speaker to join you on adventures this isn’t for you. If you want a speaker to leave in the 5th wheel or bring out to the garden on a sunny day, you will be thrilled with the performance you get with the Harman/Kardon Onyx Studio 3.